Graham was 55 when he got his appointment for a knee replacement after waiting about three months. But what was supposed to be a straightforward operation, with a hospital stay of just a few days, turned into a nightmare. “When I arrived at the hospital and got settled in, I was almost looking forward to the operation. My knee had been giving me a lot of pain for months and people I knew who had gone through the operation had told me how much better I would feel. I was really excited about being able to walk properly again,” remembers Graham. All the checks were done and, early next morning, Graham was wheeled down to the operating theatre for the 2-hour operation, just one of 30 000 people to have the same surgery that year. “With such a routine procedure, you never expect anything to go wrong,” says Graham. The actual operation went smoothly and Graham came round, a little groggy, but otherwise fine. All seemed to have gone to plan and Graham slept through the afternoon. However, when his wife Jean came to visit that evening, she knew immediately that something was wrong. “Graham was deathly pale and did not want to eat or even have a cup of tea. I was reassured by the nurses that it was just the after effects of the anaesthetic, but I still had doubts,” says Jean. 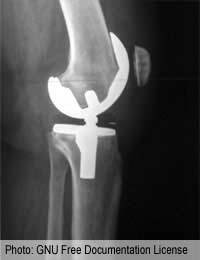 Within hours, Graham was rushed back to the operating theatre but not for his knee this time. He had developed a severe bowel infection and the large bowel had actually burst open and Graham was at high risk of peritonitis. “I remember very little of what happened during this time, but I was very close to death at one point. I think it was worse for Jean,” says Graham quietly. “It was awful. I thought Graham would be home by the weekend, but I was spending every minute at the hospital, expecting to be told that I had lost my husband,” says Jean. After 5 days, the infection was under control but the surgeon had no choice but to give Graham a colostomy. The opening of his bowel was now on one side of his abdomen, and he had to wear a colostomy bag at all times. “When I was out of it, I wasn’t worried but when I started to recover, the implications of what had happened really hit me. I still thought of myself as a young man and I hoped I had many healthy years ahead. Now I had to face the thought of going back to work wearing a colostomy bag and having to have Jean help me with it. I thought I might have been better off dead,” says Graham, obviously upset by the memories of his bitterness. After 3 months, Graham had a check up with the surgeon who had operated on his burst bowel. All was OK and he was completely free from infection. His knee had also healed well and he was doing lots of walking. “That gave me time to think and I did start to come to terms with my ‘new’ body but I also had a pressing question for the consultant,” says Graham. Graham asked if it was possible for the colostomy to be reversed. The surgeon thought that it might be an option, and referred Graham to another specialist. He had to wait three more months to get back to full health but then found himself in hospital again. “I was so stressed about the whole thing and tried to persuade Graham to leave things as they were – I still loved him, no matter what, but I could not face the thought of losing him in another operation,” says Jean. The wait was agonising and the few days after the operation really dragged by but Graham showed no signs of an infection and, after two weeks, was allowed home. The colostomy reversal had been a complete success. “It’s been three years now and I am grateful every single day that I haven’t got a colostomy bag to contend with. I know that many people who have that operation can’t have it reversed and it is a lifesaver and I admire them for coping with it. I was one of the lucky ones, and I know it,” laughs Graham.